Hummus is probably one of the most versatile, nutrient dense spreads. There are so many variations that can be used to make a great sandwich, wrap or just as a dip. This pita wrap feautres homemade pesto hummus (yum!) and roasted vegetables. Extremely simple and an easy lunch for work. This also uses Za’atar seasoning which is a Middle Eastern spice blend that contains sesame seeds and sumac. Good flavor, good nutrients, all around good feels with these wraps! Serve extra hummus with raw vegetables, pretzels, or pita chips as a snack. Preheat oven to 400 degrees. Using knife or mandolin, cut zucchini, eggplant, and yellow squash into thin slices. Toss vegetables with olive oil, Za’atar seasoning, salt and pepper. Spread onto baking sheet and roast for 15 minutes. While vegetables roast, prepare hummus by combining all ingredients in blender until smooth. Warm pita bread according to package instructions. 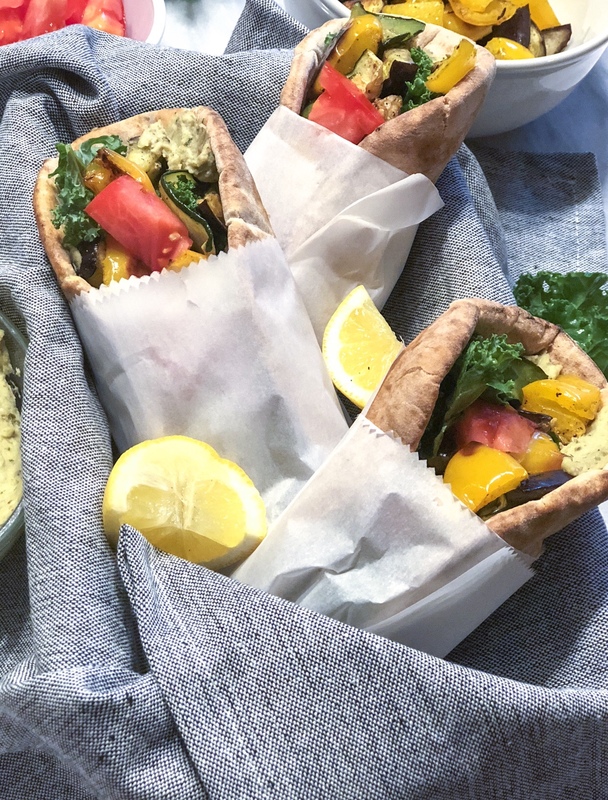 Top each pita with 1-2 tablespoons of pesto, a handful of kale, 1/4 of roasted vegetable mixture, a few fresh diced tomatoes and wrap. Serve warm. Extra hummus can be stored in air tight container in fridge for 5-7 days.